As the sun rose over Dar es Salaam, Tanzania, the ship’s company of HMS Sutherland prepared to turn their hands to something completely different to the operations that they have been involved with over the last 4 months of the ship’s deployment. The Type 23 Frigate sailed from her home port of Plymouth on 5 Jul 12 and has been working towards creating safer seas through anti-narcotics, anti-terrorist and anti-piracy operations. However, a port visit to the East of Africa has allowed the team onboard to demonstrate that their far-reaching expertise extends beyond maritime security and boarding patrols to include painting and decorating, and bringing smiles to faces of local orphans. HMS Sutherland alongside Dar es Salam during her port visit. The Royal Naval team first set to work on the external appearance of the orphanage, painting gates and fences as well as brightening up the aesthetics of the living and learning environment for the children with 2 bedrooms decorated. The engineering expertise of the team was appreciated as a team fixed the damaged local water pump as well as setting their hand to some carpentry and DIY. There was also the chance to deliver some much needed supplies of pens and paper to the pre-school as well as individual donations, many members of the crew returning without their trusty HMS Sutherland baseball caps which were a much sought after item from the children! The children performed a song and dance for the team in order to show their appreciation. Leading Physical Trainer Sion Jenkins who arranged the visit said ‘This was an opportunity not to be missed. I was overwhelmed by the numbers of volunteers that came forward to support this good cause. I felt a great sense of achievement leaving the orphanage knowing that we had helped in every way possible’. During HMS Sutherland’s port visit to Dar es Salaam there was also the opportunity for members of the Tanzanian Defence Force to visit the ship and witness a capability demonstration. This event enabled the Tanzanian military personnel to gain a greater appreciation of how units working under the direction of the Combined Maritime Forces (CMF) operate when conducting anti-piracy patrols off the East Coast of Africa and how both CMF and Tanzanian forces can work together to combat piracy on the high seas. Lt Col Abel Gwanafyo, an officer with the Tanzanian Navy Forces underlined the forces’ readiness in taking on any threat along Tanzanian territorial waters and its economic exclusive zone in the Indian Ocean. 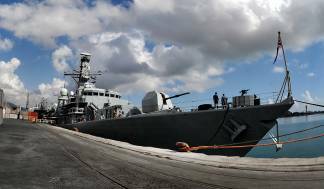 HMS Sutherland and her crew sailed from the Tanzanian coast to continue to play their integral part of CMF operations in the area before HMS Sutherland is due to return to her home port of Plymouth on 20 Dec 12.